Yesterday was a stressful day. It happens every now and then. The last one was when Ragnar-the-street-cat ate the cord to the foot pedal on my Pfaff and I had to get it fixed. While I was in the store, I bought a new Bernina (the price was right and it was the machine I had always wanted, very quiet.) The problem with new technology is that you have to learn new ways of doing things. The old ways don’t work. It stretches you and it stresses you. AdventureMan has been after me to update my iPhone. We are about to travel again, and he wants us to be accessible. He is right; it is my turn to upgrade. I’ve had my iPhone since 2011, and it works wonderfully. I am happy. It does everything I need it to do . . . except it doesn’t work overseas. I’ve dragged my feet. To me, a phone is a tool and the tool I have does everything I want it to do, including . . . making me not too accessible. But (audible sigh) I know he is right. What if there is an emergency and they need to contact us? I am also skeptical. When we upgraded AdventureMan’s phone, we went on the Viking Ocean Cruises Wake of the Vikings trip (which was awesome) and his new phone didn’t work, didn’t get texts, didn’t get phone calls, while my old phone occasionally got texts (I believe it was a Wi-Fi thing for me). But I also know that AdventureMan is wise; things happen. We often take off from the group, and if our connection changes, if the shuttle back to the ship changes departure time and we are not on it, it causes all kinds of complications. He is a smart man. He knows how to ask me in an open-mannered way so I don’t go all defensive and nasty because I am feeling cornered and inconvenienced and wary of having to master a new technology when I have a lot of other things going on right now. “I’m going to do it tomorrow,” I tell him. He is satisfied. He knows that when I say I will do something, he can count on me to do it. I didn’t sleep well; I was full of dread. So I am working at my computer when AdventureMan gets up and says “So when are you going?” and I know that the day has a limited number of hours and some of them are already committed and I really need to do this, so I do. When I arrive at the store, the door says the store opens at 10:00, but it is 9:30 and the door is unlocked and people are waiting inside for customers, and tell me to come in, it is a special sale day. I get a really great guy, Mark, and tell him what I need. He was astonished. “You’re not here for the NEW iPhoneXR?” he asks, like he cannot believe what he is hearing. I tell him what I need, and he says “You need the new iPhoneXR.” He tells me all the things it will do, and then starts showing me how it will work. I tell him what I need is a phone that will work in these countries, and he shows me two ways it can work, both of which I feel comfortable I can do. And the phone is beautiful. And handy. Within five minutes, I have said “yes” to the phone, have picked out chargers and phone case and protectors, and he is transferring all my phone stuff from the Cloud to my new phone. 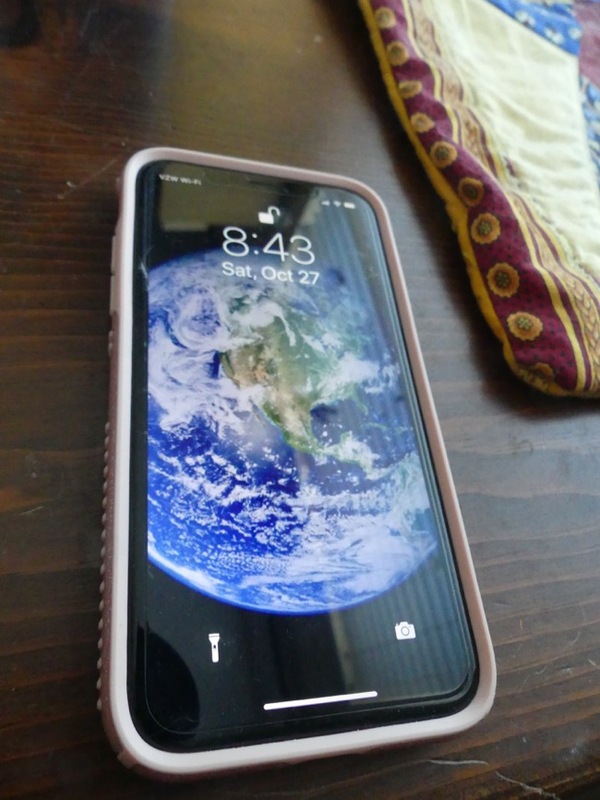 Of all the things that delight me, at the time, one is that I found a sturdy pink phone case that sparkles; my granddaughter will love it and think I am very cool. It makes me laugh; I am not a woman who would ever have carried a pink sparkly phone in my professional life. What I love, having played with it for a day, is that it is so easy. My eyes are really good, except for reading, and the screen of this phone is large and the writing is very readable. There are Tips! They tell me all the things I can do, whether I want to do them or not. There is Siri, whom I don’t intend to use, but I set it up because you never know, I might. So I just tried Siri, “Siri, open Google Maps and take me to Cologne, Germany?” and it took a couple steps, but . . . it’s a miracle! It worked! “Siri, what is the water level of the Rhine River in Cologne, Germany?” (Blah blah blah blah “take a look!”) and the German website, one among many that she found, showed the water level in Koln to be . . . 74 cm. Hmmm. Not really enough to float a ship. Our trip no longer shows on the company website. We have heard nothing. I am guessing they are both praying for an extended rain and scurrying to arrange alternatives should the water levels not rise high enough to float the boat along some of the narrower passages of the Rhine, which is experiencing historical lows following one of the driest, hottest summers ever in Europe. AdventureMan and I avoid bus travel like a plague. It is too restricting on people who like to move, it is claustrophobic and not-private. On the other hand, you see a lot more on the road, and since we are really going because we miss the winter in France and Germany, on a bus (or two) we will have more actual time on the ground, eating winter food, wearing our winter clothes, more time to walk, God willing. And . . . I have a new iPhoneXR, and I actually love it.